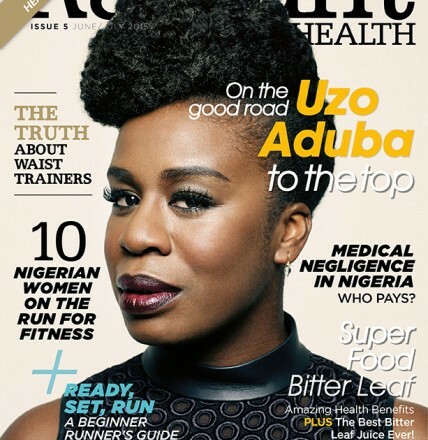 Nigerian-born Hollywood multiple award winning actress Uzo Aduba is the cover of June 2015 issue of Nigeria’s Radiant Health Magazine. The elegant actress gives a close up on her Nigerian roots and how she went from athletics to the screens of Hollywood. My mother is from Anambra State and my father is from Enugu State so I am a full blooded Nigerian, I haven’t been in Nigeria for about 4 years now but I stay connected to family and friends back there. Growing up, my parent raised us to think of ourselves as Nigerians though I and my four siblings grew up in Massachusetts. My mother in particular was adamant about Igbo being spoken in our home, not just for understanding but for fluency. We can all cook a traditional Nigerian dish, even the boys. I’m very thankful that my parent have helped to preserve our cultural heritage as African as it is one of the easiest things to lose these days. There are so many schools in and around Boston: MIT, Harvard, BU, Emmanuel College, Wellesley College and you would be surprised at number of Nigerians attending these schools. I’m guessing a lot of people went to school and ended up settling there. My mother started off in the Connecticut area, having been married before to a man that was at Yale but unfortunately passed away. My father was in the New York/New Jersey area and my parents met there. Our family settled in the Boston area when my father got a job there. My parents were both very athletic people. My mom was a tennis player in college in Nigeria and she encouraged me to find an activity. She was like, “You need to find something to do. You can’t be coming home after school every day and not doing anything except homework.” After I stopped figure skating, I started running in my freshman year of high school. I ran track throughout high school and college as well. My mother, Nonyem Aduba née Anyaoku, did [play tennis] and she was very good! She won the West African Singles Tennis Championship, which is an equivalent of America’s NCAA. She came to America and was a tennis pro as well for a long time. She believed in sports and believed in sports for girls as an extracurricular activity. My brother Obi, who just retired this past September, was a minor league hockey player and went to a college with one of the best hockey programs in the country on scholarship. Obi is an exceptional athlete in general, and he’d been playing and making his living for the last seven years as a hockey player. Also, my sister Chioma is a track and field All-American and Olympic trials athlete. It’s an inside out sort of thing. Exercise of any kind is good for your body from a health perspective as well as a spiritual and emotional perspective. I find that there’s something meditative about it that I love. It’s very cleansing of the mind, body and spirit. There’s something about the endurance required that can be applied to life, whether that’s career, love, friendship or whatever. That endurance lends itself to stamina which enables the ability to survive and come through anything. On a mental level, I love that. Physically, it strengthens the body because it gives the whole body an aerobic workout. I love strong-bodied, strong-minded women and girls who are committed to owning their power. Every woman should seek strength in life.